It’s tough to be mean-spirited and fun, and I don’t know if anyone pulls this combination off better than the British. Their horror films especially carry such a wildly entertaining nasty streak that it’s almost immediately recognizable, if not codified: you know that grisly but darkly amusing Amicus brand of horror as soon as you see it. The Legacy is technically only half British since it was co-produced by Americans, but there’s no denying its macabre English sensibilities. Here’s a movie that can find the trashy pleasure in watching a bunch of assholes being drowned, immolated, and stabbed to death. Sometimes, gory comeuppance is the best punchline. Granted, The Legacy is deliberate in its delivery of it. Much of the film is predicated on a drawn out mystery initiated by a phone call to Maggie Walsh (Katharine Ross), a Los Angeles interior decorator who receives a strange job opportunity from across the pond. Both she and her boyfriend Pete (Sam Elliott) are wary but soon find themselves compelled to take the gig when their current client suddenly dies. Their jaunt to England starts auspiciously enough, at least until an accident leaves them stranded on the side of the road with no way home, at least until the driver of the other vehicle (John Standing)—who just happens to be a reclusive millionaire—offers to put them up in his mansion for the evening. What’s more, he’s actually the mysterious client who summoned Maggie to England in the first place, meaning an already suspicious situation only grows more so, especially once a cadre of other guests begins to arrive. Before arriving at the nastiness, The Legacy is also very British in its deliberate, mannered pacing and aesthetic. Director Richard Marquand helms the proceedings with a sort of unassuming steadiness that leads viewers into some familiar territory, particularly when you consider the movies that were all the rage around this time. For all intents and purposes, The Legacy looks to follow in the footsteps of the handsomely produced haunted house movies of the era, like The Legend of Hell House or Burnt Offerings. In fact, it’s something of an intersection between those two, as it gathers both a group and an unsuspecting couple under one very shady, very menacing roof. But there’s something especially shifty about this particular haunt since the nature of the threat is ambiguous. The various tenants—all of whom wear similar rings—speak about their shared history with the house’s owner, whom they insist rests within the bowels of the place, stricken ill by a life-threatening disease (this despite the fact that Maggie and Pete found him in perfect health only hours earlier) and looking to pass on his legacy to a worthy successor. The Legacy thrives on a mystery that’s teased out so purposefully that it feels like a big deal when Maggie (and the audience) catches a glimpse of an inhuman hand that grafts a ring onto her finger. While it doesn’t provide many answers, it does hint that this house is hoarding some very peculiar secrets that might eventually justify the somewhat languid setup. Once it finally begins to reveal them, The Legacy doesn’t disappoint. Each revelation drips with bloodshed as the visitors fall victim to grisly fates, each more absurd than the last. A woman’s death via drowning almost feels quaint once the bloodletting escalates to a botched tracheotomy and an inexplicable immolation. The cliché is to compare these gruesome, irony-tinged dispatches to Final Destination, which is correct despite The Legacy arriving two decades earlier; however, as Maggie and Pete continue to rummage through the house and uncover the true nature of the mysterious benefactor’s inheritance, there’s an unmistakable mean streak that’s somehow more delightful than it is disturbing. Before long, you begin to sense that these visitors have been summoned by karmic forces—it turns out that The Legacy is similar to an Amicus frame story, only it’s also been cross-pollinated with the occult and witchcraft. In many ways, it’s a grab bag of 70s Brit horror preoccupations, one whose ingredients have been jumbled up and tossed around for maximum what-the-fuckery. Grounding the wild ride are Ross and Elliott, both of whom provide a stable presence and a nice reminder that lavish but silly studio horror productions attracted some incongruently great casts during this era (The Legacy also boasts Roger Daltrey, whose scenery chewing turn feels appropriate given that he nearly chokes to death). As the two Americans among a bunch of Brits, Ross and Elliott make for natural contrasts, with the latter’s folksy ruggedness especially clashing with the mannered hosts surrounding him (naturally, the house’s servants are particularly shifty-eyed around him). He also provides a subtle sense of misdirection—here Elliott is in all his glory, serving as a perfect avatar for 70s masculinity (read: he looks like he could appear in a beer commercial at any time), yet he’s practically helpless. His common sense is on point: when given the chance to finally escape, he jumps at the opportunity (which is scored with awful cornball disco wah-wahs—at times, The Legacy is painfully 70s) but is ultimately thwarted when he and Maggie just can’t escape for whatever reason. The logic here is fuzzy but in the service of a film that’s ultimately guiding both its characters and audience with a sinister sense of inevitability. Where it’s going isn’t predictable; that it’s going somewhere is undeniable, even when it’s slogging through a middle act that’s full of cryptic dialogue and a suspicious cat (speaking of 70s horror preoccupations). All the familiarity almost feels calculated in light of a whackadoo ending that goes off-page in surprising fashion. In keeping with the rest of the film, it takes a situation that should be disturbing but finds the fun in it, so much so that it’s almost a bummer nobody ever produced a follow-up. I’d watch at least a few sequels featuring the exploits of the survivors here (suffice it to say it involves Sam Elliott playing tagalong to a sorceress, aka a license to print money). Maybe that’s just me, though perhaps you’d like to judge for yourself. 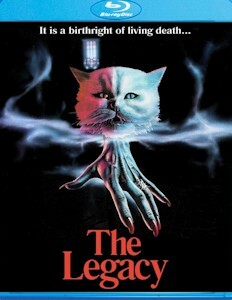 Luckily, Scream Factory has provided a perfect excuse to check out The Legacy with a new Blu-ray release that includes interviews with editor Anne Coates and make-up artist Robin Grantham, plus an assortment of promotional material (TV spots, radio spots, a trailer, and a photo gallery). When paired with Scream’s release of The Sentinel, The Legacy makes for a fine half of a late-70s twin bill featuring leading men in Elliott and Chris Sarandon that will make you feel inadequate. Both are also fine reminders to be wary of both cats and old people, perhaps in that order.